Your perception at work place is important as an employee. The manager’s perception on you in your work place is vital as it can have an effect on the way he measures your performance. This may also lead to have a negative effect on your career. To alter your managers perception on you, make sure to be a willing employee and offer contributing efforts and also get involved in other activities in the team. Changing the manager’s mind can make a big difference that hangs between promotion and unemployment. 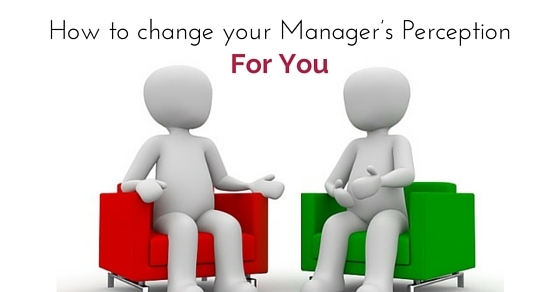 Let’s glimpse through a few hints on how to change manager’s perception for you. Though by nature you’re a shy and secluded person try to be pally with other co-workers in your workplace. Dig into and get to know about the projects and assignments they are working for. Also get to know the clients they are interacting with and projects status at that time. At times of break, lunch and other happy situations, make sure to mingle with friends and enjoy. By this way, your care will be observed by your manager and co-workers. This is also a chance for you to enjoy yourself. This helps the manager to change his perception on you. It is important to come forward or volunteer in your organization when your co-worker needs help. Volunteering for tasks can be the best key to change the manager’s perception on you. Pretending for any project and also by faking any important phone call can get you out of the assignment. Being honest and rolling your sleeves at times of help when your team needs, develops a good impact about you in your managers mind. A good employee should always be ready to accept feedback from employees as it stands to be a motivating factor to improve your performance. It would be good for an employee to seek help, advice from other employees at work place. There is nothing that can make you less competent when you ask for help from others, so do not ignore to clear your doubts and carry on with work. When you’re open for help and assistance from your team or colleagues, it shows that you’re a part of the team. When you’re working in any assigned task make sure that nothing would go as planned and scheduled. Things may change at any time and hence the employee should be flexible and adjustable to any situation. Instead of getting angry and highlighting yourself, adjusting is very important according to the altered conditions. You pave way for growth and learning new methods by adjusting to the changes that happen in your work. This is one main aspect which can change the manager’s perception on you. Recommend your co-worker and show that you also worked closely with his skills and learned many aspects. By this way you are also showing that you’re thinking about others before yourself. This shows that you’re more bothered about your team and its success. This is one another way to change the manager’s perception on you. When you have colleagues who are struggling to complete their work or meet their deadline, never hesitate to help. Offer a helping hand and help them complete their work at time. You can stay up late and help your co-workers complete their tasks. You can also help other members in your organization who come in early for briefing. It is really a good habit to ask your colleagues if they need any help, if you’re with down time. There can be many needs an organization must be fulfilled with. Take a look at your work place and note down the needs that are to be satisfied. When you do such activities it adds to the well being of the co-workers and organization. By this way you can reach out to your colleague and your manager will notice all this without you explaining yourself. While at work place you should be one of the common and noted figures. You should participate in all the events either its work related or for relaxation and fun. All activities outside the office premises such as dinner, being a part of softball team and more are few ones which you should participate and be a member of. These aspects may not be described in your job description but this aspect marks you as an employee who cares about team and plays a main role in all aspects. This can be one way to change manager’s perception on you. Either its work related tasks or any other petty tasks around the work place make sure that you take initiative. When your manager has planned for any meeting, outing, or any other related tasks. Make sure you are the first one to come forward and take initiative and carry on the tasks, by this way the manager is impressed and his perception on you changes. It is always important to show your skills and talent in your work. When you’re assigned a task make sure you use your skills and creativity and complete your project in the best manner. Open up your achievements to your manager and show that you’re capable to think out of the box in an innovative manner. Your consecutive success can be one tool which turns the manager’s view towards you. Manager’s perception on you can thus be changed in this manner. It is always good to be respectful and polite in your work place. You can hear a number of things in your workplace about you such as rumors, some inaccurate information about you, at such moments being calm and polite is important rather than being defensive. The attitude and the way you behave in your work place is very important for your manager to have a good perception about you. A sign of professionalism and maturity is observed when you accept criticism at work place at time of feedback or from manager for various reasons. Every word you speak in your work place counts and hence it is important to think in the right manner before you speak. It is always good to avoid unpleasing words and think many times before you give out a word. You can be angry and find someone’s work as haphazard, but remember not to speak out with anger and emotion. Being professional in all situations is another way which can change manager’s perception on you. You can be an employee of the type where you always crack jokes and make other employees happy. But remember that there is time after work for all gossips and jokes. When you’re insisted to crack a joke show someone else and change your focus. You can be an all-rounder, fun loving guy in your work place but remember to have a limit. Limit your email jokes and maintain a professional working look for yourself. All these aspects can change managers perception on you. The style of speaking with your manager must be changed; initially you should understand your manager’s needs regarding work. When you are asked to submit any work related task, if you’re managers required detailed data such as graphs, charts, facts and research, do submit your work in that manner so that he is impressed. By offering what your manager needs can be one way to change your perception. When you’re an employee with good attitude and behavior, your co-workers and other employees are ample to speak about your good points to your boss. You don’t have to market yourself. You will be promoted by others for your good behavior at work place and hard work. By this way the manager would definitely have a good perception on you. The above mentioned steps are one which can be guaranteed to change your manager’s perception on you. These can be a few reminders which employees can follow in order to make them stand out of the rest. By following these steps the manager would surely have a positive perception on you and you can have good chances for promotion and other hikes. By this way you allow your manager to share your values and good aspects to higher officials. This can be a good chance where success reflects on you at times. In this manner the managers will also have a good perception about them by their work and behavior at work place.